We are proud to announce the continuation of our work in the Autonomous Region of Bougainville after the successful conclusion of the Panguna Dialogue Project at the end of 2016. Bougainville has entered a decisive stage of its history. In May 2016 the Autonomous Bougainville Government (ABG) and the National Government of Papua New Guinea (PNG) agreed upon a target date for a referendum on the future political status of Bougainville – 15 June 2019. The referendum, which is one core pillar of the Bougainville Peace Agreement (BPA) of August 2001, has to include as one option complete independence for Bougainville as a new nation state. Peacebuilding on Bougainville will only come to a successful end with the conduct of the referendum and the implementation of the referendum results. Hence it is of utmost importance that the process towards the referendum will be peaceful, inclusive, democratic, effective and legitimate. People and communities have to get ‘referendum-ready’. To achieve this, a lot of work has to be done over the next few years. As of today, most Bougainvilleans lack information about the nature of the referendum, the process of referendum and the potential impacts on their lives, communities and society at large. Therefore public awareness on the referendum process has been identified by the ABG and the PNG government as one of the urgent needs for ensuring the credibility, integrity and inclusiveness of the referendum. There is a need for a more coordinated and strategic approach in the conduct of public awareness campaigns and consultation activities. While some work has already started to develop an awareness raising strategy and education materials, so far direct community engagement with people in the villages of Bougainville has not occurred in any coordinated fashion. This is where our project aims to make a difference. PaCSIA will work in partnership with the recently restructured Department of BPA Implementation and liaise closely with the Constituency Referendum Committees that the department is currently establishing in all constituencies of Bougainville. The Bougainville Referendum Dialogues will engage communities all over Bougainville in meaningful exchange of information and discussions about all aspects of the referendum, the process towards the referendum and implementation of referendum results. Dialogues will not only provide information about the legal and political processes and potential future impacts of the referendum, but will also create the opportunity for community members to express their own concerns, hopes and ideas about a more peaceful and prosperous future for Bougainville, in connection with the referendum. The Bougainville Referendum Dialogues will build on the experiences of the Panguna Dialogue Project (PDP), which PaCSIA has carried out together with Bougainville partners – the local NGO Bougainville Indigenous Dialogue (BID). PDP addressed local communities in the Panguna mine area to engage them in discussions about community problems, stories of strength and success, and in planning constructive actions to alleviate their problems. PDP’s dialogical approach to community development and education created safe spaces for discussion, critique, learning and constructive engagement. This dialogical approach will also be used for the Referendum Dialogues. People will not be treated as objects who have to be taught from the outside and from above, but as knowledgeable partners in a dialogue so that they can also bring in their views, concerns and experiences. Such an approach can produce knowledge and information that is important to the ABG and the institutions tasked with administering the referendum. The local facilitators of such referendum dialogues can report back to them about concerns and views in the communities. In this regard the referendum dialogues will act as a process of ongoing community consultation to inform the ABG and the technical teams working on the referendum process and to forge ownership of the process within the communities of Bougainville. Dialogue is thus used as a bridge between the political process led by the government and communities at the grassroots. 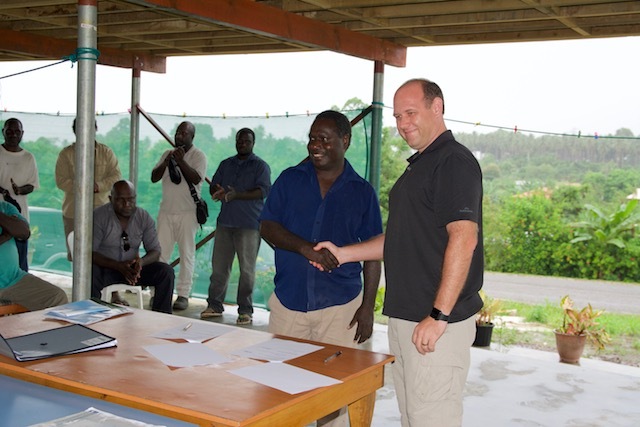 After a successful initial trip to set up a project coordination hub, PaCSIA project leader Dr Serge Loode and Secretary of the Department of BPA Implementation Mr James Tanis signed a Memorandum of Understanding outlining the partnership between the Autonomous Bougainville Government and PaCSIA on 6 February 2017. The project is funded by Misereor e.V., the development agency of the Catholic Church in Germany and supported by the Catholic Diocese of Bougainville. The PaCSIA team is currently heading back to Bougainville to develop and plan the Bougainville Referendum Dialogues together with local facilitators from each constituency.